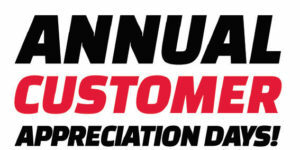 Farmers Coop Ozark is hosting a Customer Appreciation Day on Friday, May 3, 2019, and we’d love for you to join us! At Farmers Coop, our customers are the BEST, and to show our appreciation, we’re having a very special event just for you! The savings kicks off at 7:30 am and goes until 5:00 p.m. Come out from 11 to 1:00 p.m. for FREE lunch a live broadcast from KDYN Radio. Make sure and stay for our Vet Gun demonstration. Don’t’ forget to put your name in the drawing for a chance to win a Farmers Coop Ozark gift certificate. Questions? Give us a call at 479-667-3825. We can’t wait to host you! While you’re here, take advantage of our awesome 1-day specials! This entry was posted on Wednesday, April 10th, 2019 at 3:05 pm	and is filed under Events, News & Updates. You can follow any responses to this entry through the RSS 2.0 feed. Both comments and pings are currently closed.